For some strange reason I am always leaving my knitted gifts to the last minute. Peter’s jumper is proof af that, he never did get it in time for his birthday. It’s done now, just in time for summer! Maybe I can give it to him next birthday? I am sure I’m not the only knitter who’s ideas are bigger than her or his time frame. Today’s last minute gift is finished ahead of time. 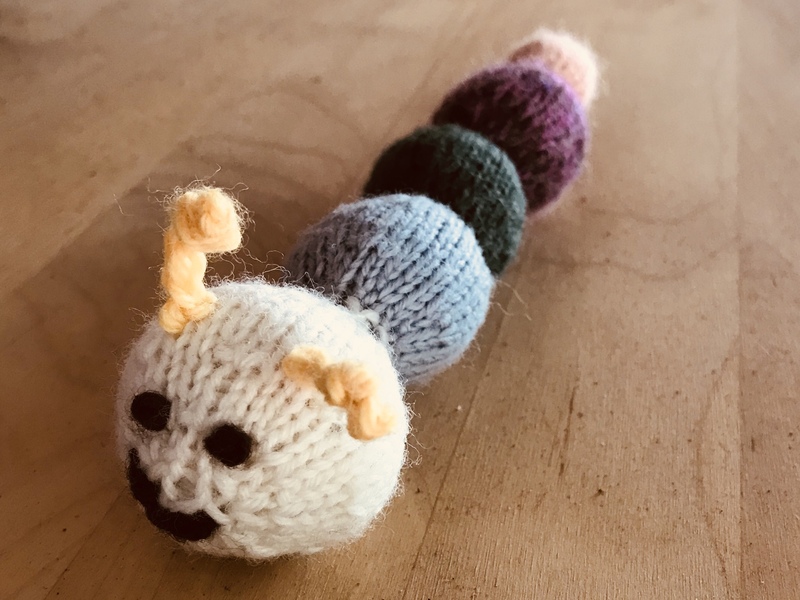 This little worm I last knitted about 10 years ago, before Michael was born. He was a firm favourite with both Michael and Heather as babies. The pattern is here on Ravelry. Little Joe the worm, designed by Miriam L. Felton is a cute last minute gift for a special little person. Perfect for little hands to hold and little mouths to explore. I very much appreciate the time and generosity of designers who do all the work putting together such great little patterns and then offer them for free. I used magic loop to knit this little fellow seamlessly. I will run a magic loop class in 2018. Make sure you knit all those little scraps of yarn in your stash so you can pop in and buy more.